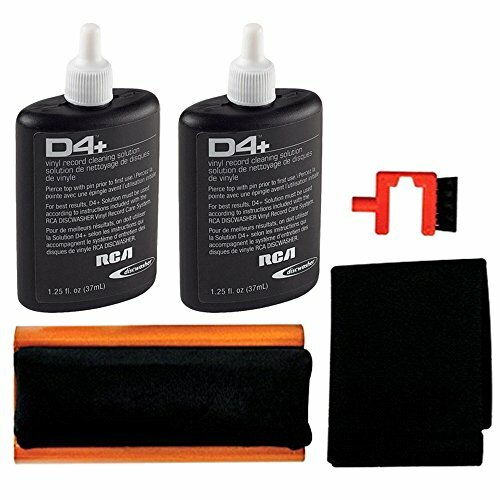 The specially formulated D4+ cleaning fluid lifts contaminants from - and suspends them above - the record surface for removal by the soft, non-abrasive, unidirectional fibers of the pad. Together, the fluid and the pad eliminate the airborne contaminants, particulate matter and oily fingerprints that work their way into the record grooves, without depositing residue or extracting crucial vinyl stabilizers. Regular use of the Discwasher's Vinyl Care System not only helps keep your records sounding their best, but extends the effective playing life of your valuable records, providing you with many years of enjoyment. Discwasher recommends that each record be cleaned before playing. Clean records are vital for snap/crackle/pop free listening not only now but forever. When the diamond needle tip runs over your record, it is several hundred degrees F. At the point of contact, for just a split second, it actually melts the vinyl. The bummer is that if there is a spec of dust there, it may get melted into the vinyl, FOREVER and will always give you a nice little snap, crack or pop EVERY SINGLE TIME you play that record.The time to keep your records clean is NOW before you ever spin them again.